The Killers Pay Tribute To Detroit Legend Bob Seger With Fantastic, Acoustic Cover of ‘Night Moves’! Alternative rock band The Killers are notorious for honoring rock legends of the past during their concerts. When the band performs live in a city, they will usually cover a song from an artist from that is from that area. 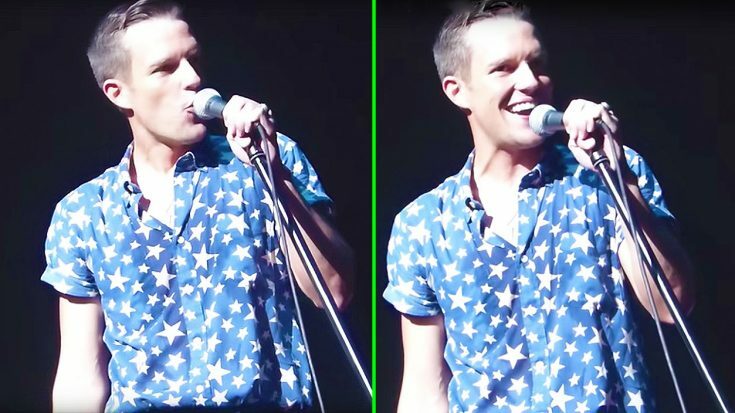 While the band was performing in Windsor, Ontario in Canada, the Killers admitted to the band that the3y struggled to think of a band from that area. So, lead singer Brandon Flowers had an alternate plan: he told the crowd that across the river in Detroit, Michigan, lived a legend. He was referring to Bob Seger, but before he even mentioned Bob’s name, the crowd instantly knew who he was talking about, and they gave a loud cheer. That prompted everyone to give a huge cheer, and the Killers instantly kicked into a cover of “Night Moves.” We’ll be honest, it’s not the best cover of “Night Moves,” nor the best cover from The Killers, however it is admirable! Brandon’s voice is insane, and if the band cleans up the cover a bit, we’d love to hear a studio version of it! Check it out down below, and let us know what you think!